Can we use volcanoes to cool the Earth off? We’ve Heated Up the Planet. Can We Cool It Back Down? Strangely enough, massive volcanoes might be part of the answer. A volcano may look hot, but the sulfur dioxide it releases can actually have a cooling effect on the planet. Exactly two centuries ago this summer, it was winter. The world didn’t end in 1816, but it’s still worth observing this bicentennial. It’s a good reminder that it doesn’t take much for the world’s climate systems to be thrown completely out of whack as we are currently learning, thanks to the extra CO2 we’ve pumped into the atmosphere. In fact, since our problem is essentially the opposite now, some even think the Year of No Summer might provide an unorthodox solution to the problem we find ourselves in today. Could we use the same mechanism that cooled the planet then to cool the planet now? So what caused the cooling? At the time, no one knew why the weather was upside-down. The winter of 1815–1816 had been fairly mild in the Northern Hemisphere, aside from occasional (and, I assume, alarming) reports of snow the color of rust or blood. It wasn’t until May or June, when continual frosts delayed the planting season, that people got worried. Everyone had a theory. God was doling out punishment, surely. Large sunspots were seen in 1816, and so that might have something to do with it. Much of the East Coast was deforested, so maybe it was colder now that there was nothing to block the wind? It could be that earthquakes were responsible, somehow. Ships were also reporting more ice in the North Atlantic … ? No one had it right. The true cause of the Year Without Summer lay half a world away on the Indonesian island of Sumbawa. It was a volcano, Mount Tambora, that had erupted more than a year before. That eruption had been one of the largest in recorded history. It’s estimated that 10,000 to 15,000 inhabitants of Sumbawa died as a direct result of the volcanic eruption and associated tsunamis, and another 70,000 to 100,000 perished from the resulting ash fallout, which covered crops and villages in several feet of ash in a 100-mile radius. Despite its enormity, little was known of the eruption outside of Indonesia, says Nicholas Klingaman, senior research fellow at the University of Reading and co-author of The Year Without Summer with his father, historian William Klingaman. 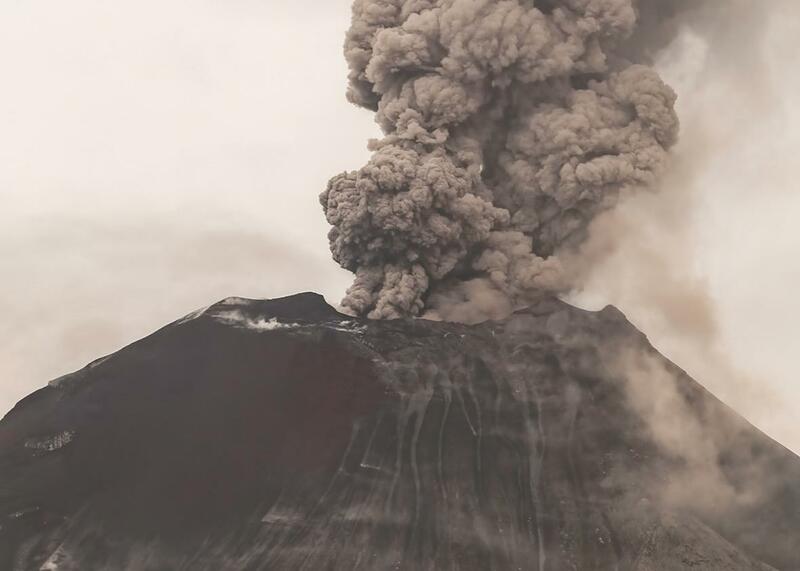 There were some mentions of the volcano in newspapers, but no connection was made between the Northern Hemisphere’s weird weather and the Indonesian eruption. More than 18 miles above the surface of the Earth, well above the eruption’s ash cloud, the sulfur dioxide condensed into aerosols and drifted around the globe in an imperceptible haze. Unlike greenhouse gases, which trap heat radiating off the Earth and contain it in the atmosphere, aerosols reflect sunlight before it can reach Earth, resulting in a cooler surface. Though the aerosol haze produced by the Tambora eruption reflected less than 1 percent of sunlight, that was enough to drop global temperatures by 2 to 3 degrees Fahrenheit by the summer of 1816, causing a catastrophic weather chain reaction. According to Klingaman, the cooling effect of the sulfuric aerosol was stronger at the tropics than the poles—the closer to the equator you go, the more direct the sunlight. These imbalanced temperatures altered wind patterns, including the jet stream winds that usually bring warm air up the U.S. East Coast from the Gulf of Mexico in a typical winter. So, cold Arctic air replaced the missing jet stream over New England and northern Europe, resulting in the warped climate that killed thousands and uprooted the lives of millions. The amount of global cooling that occurred during The Year Without Summer is just a bit more than the amount of warming we’ve already experiencing from increased greenhouse gas emissions. The difference is that while the gas from Mt. Tambora had dissipated by 1817, we’re emitting carbon dioxide continuously. Even if we stopped entirely right now, our existing emissions would continue to warm the planet for years. Klingaman says that if there’s a lesson we’ve learned from the Year Without Summer, it’s that small changes to the Earth’s climate can dramatically disrupt human civilization. The eruption of a single volcano not only killed thousands of nearby inhabitants, but also caused the inversions of weather patterns on two continents a full year later. The Year Without Summer is definitely a warning. Could it also be part of a solution: Could humans add sulfur dioxide to the stratosphere to combat global warming? Actually, maybe. We can’t control volcanic eruptions, of course, but scientists who advocate for the study of solar geoengineering say that we could potentially use airplanes to add diamond dust or sulfuric acid into the stratosphere, increasing the amount of sunlight reflected from Earth. Proponents like Harvard University’s David Keith assert that solar geoengineering could stabilize world climate while we work to reduce greenhouse gas emissions, or, more optimistically, create technologies that remove carbon dioxide from the atmosphere to eventually return to a preindustrial climate. It sounds like sci-fi, but Keith argues that the case for solar geoengineering is rooted in long-accepted principles of environmental management, which seeks to both remedy the problem and provide a hospitable landscape during the improvement. In his mind, it’s not all that different from the reintroduction of peregrine falcons, which nearly became extinct in the U.S. in the middle part of the 20th century, but recovered thanks to both the banning of the pesticide DDT as well as an intense reintroduction program that improved habitat and released healthy birds. Plus, we really really need it—even if we could instantly stop greenhouse gas emissions altogether, Keith says, it wouldn’t be enough on its own to stop climate change, but cutting emissions combined with solar geoengineering could stabilize warming and prevent things from getting worse. That may be because if there’s one thing we’ve learned from the eruption of Mt. Tambora, it’s that the world’s climate is fragile. We’ve already dramatically altered the entire world, and not for the better. People are understandably gun-shy about treating the entire atmosphere as a mixing cup for a large-scale experiment, and geoengineering would come with some serious consequences we’d have to weigh. * Unfortunately, the crisis we’re currently facing will last much longer than a season.